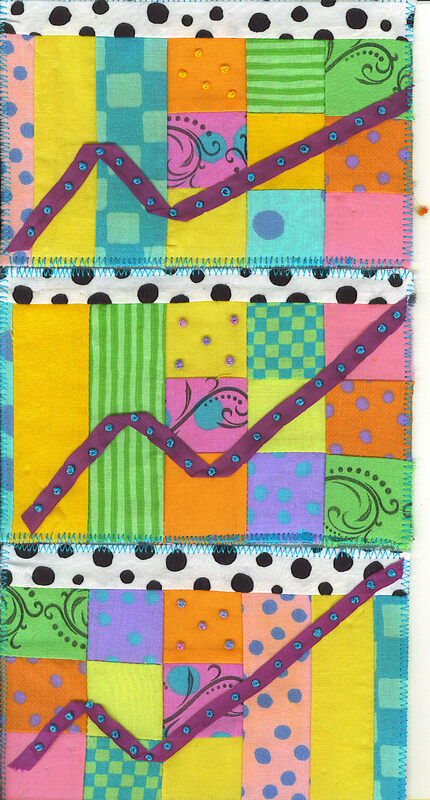 Here are my scrap postcards for a swap that I joined at Cloth Paper Studio Yahoo group. I picked through my fabric scrap box and found these 3 nine patch blocks and a few strips leftover from a previous project. I added the maroon silk ribbon and turquoise french knots just to mix it up a bit. The backing is the black and white polka dot. To keep these stiff like a postcard, I used Pellon Peltex as the middle layer. These measure 4in. x 6 in. Another great way to use up your scraps! Enjoy! This entry was posted in 2008 and tagged embroidery, quilting. Bookmark the permalink. I just love the colors! So vibrant and fun! Cute, Marci! can’t wait to see them in person!! Hey, thanks for the info. I’m going to have to try it sometime. Hi Linda! Yes, I have mailed over hundred fabric postcards through the US Mail system. I don’t seal them. I make sure that the edges have been sewn so it does not come apart. All of the ones I sent made it through. You do have to add extra postage though – usually 2 ounces covers it. Let me know if you have any other questions. These look great. Have you ever actually mailed a fabric postcard? Would you recommend sealing the top before mailing?